45 Years director Andrew Haigh heads to the U.S. for this gentle, tender story of a young boy in trouble who finds comfort in an unwanted racehorse. British filmmaker Andrew Haigh (Weekend, 45 Years) hits the American highway for this touching, slightly underwhelming tale of a troubled teen who strikes up a rapport with an ailing racehorse. This good-natured four-legged friend can’t arrive quickly enough for Charley (Charlie Plummer), a boy living in Portland, Oregon, who’s unsure of his future. His mom is long gone, a loving aunt is nothing but a haunting memory, and his well-meaning but wildly erratic dad (Travis Fimmel) is hardly a show horse in the parental stakes. It’s not for kids, but this adaptation of a Willy Vlautin novel plays like a thoughtful art-house spin on a parable for children, one that’s not afraid to make us do the work of imagining what’s going on in its main character’s mind. The movie’s strongest scenes come early, as the collapse of Charley’s fragile homelife is softened by finding a new purpose elsewhere. He earns cash helping out likable old racing hand Del (Steve Buscemi), who enters horses in scrappy local competitions, sometimes with the help of former It jockey Bonnie (Chloë Sevigny). But this sense of a new dawn is not to last. Charley is never far from life’s cruelties, and they pile up when he runs away with the horse, meeting various characters en route, some more welcoming than others. There’s tragedy, too, but what’s most winning about Lean on Pete is how Haigh never lingers on misery. He’s as interested in surprising kindnesses and the goodness of most folks as he is in life’s knocks. Haigh is nothing if not a sensitive, compassionate director, and he puts a lot of faith in young Plummer in the film’s many quiet scenes, especially those in which it’s just Charley and his silent companion. As the story becomes more episodic and Charley ends up farther and farther from home, the film feels distant from its earlier, more nourishing moments. 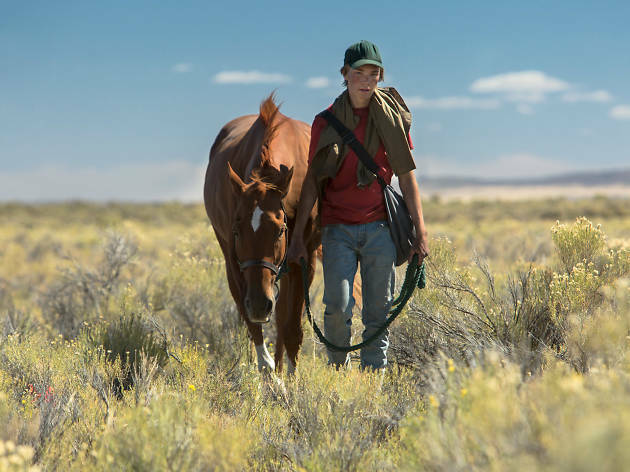 It’s a road movie in which the origin is more interesting than the finish line, but Lean on Pete is never less than fully felt.